We live in a small cabin, so when grandparents want to buy the children something big, outdoor toys are great. The Austrian Sand Box, available through Magic Cabin, is one such gift we have thoroughly enjoyed. Children love to play in sand, and such sensory experiences are good for their development. 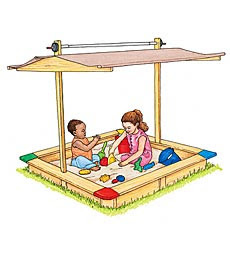 They can explore all kinds of physical concepts while playing in the sand. The Austrian Sand Box is made of spruce and comes with a vinyl cover. The cover can be cranked up to provide shade for children and protection from the sun or light rain. When the cover is lowered, the sand inside the box is protected from wandering animals that may want to use if for a litter box. The sand box is large enough that four children can comfortably play inside it. Putting together the sand box is a challenge, and it took me several hours to figure it out. My friend Laura had a similar experience with their Austrian Sand Box. In addition, the stitching on our vinyl cover has come undone, but I can’t really blame the manufacturing of the product on this repair. Our 125 pound “puppies” use to run across the closed sand box lid for fun. It was an easy repair with a staple gun. In addition, over the course of two years, the uprights that support the cover have become wobbly. My friend had a similar experience with hers, and she took it apart and retightened the connections. Our hot, dry summers probably cause the wood to dry out and shrink, so adjustments are needed. It takes approximately five 50 pound bags of sand to fill the Austrian Sand Box. Be sure to buy safe “play” sand, as contractor grade sand contains fine carcinogenic dust. Our sand box has been a godsend for entertaining the kids while I work in the garden, mow the lawn, prune fruit trees, etc. Z Recommends suggests parents get second hand plastic play structures for the garden. Personally, I find these toys an eyesore and do not mind the spruce Austrian Sand Box in my yard, as it is aesthetically pleasing. We loved the sandbox. Our vinyl has torn and we need to replace it? Do you have any ideas/suggestion? My cover has not torn yet, but my friend’s did. She replaced it by using a blue tarp and a staple gun.